The AP, of course, is required to be “fair and balanced” in its reporting of any event, and no less so a media event planned by the White House. But this photograph tells a somewhat different story than the headline. First, it is important to note that in its published version the photograph is smaller by at least half than the version I’ve reprinted above, and this is not inconsequential to the interpretation it invites from its viewers. Shot from a low angle, as per the convention for emphasizing the power of the president, it is also shot from the side and at long distance. Indeed, the president is miniscule, once again dwarfed by the scene in which he is performing his office. Indeed, he is so small in relationship to his surroundings that it is hard to know exactly what he is doing—one has to strain to recognize that he is standing at a podium. 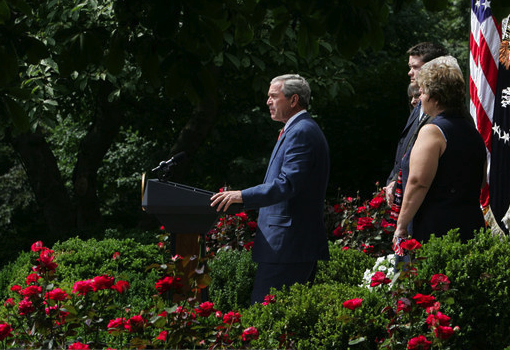 He is backed up by an entourage, but they are almost entirely obscured by the roses, which clearly dominate the scene. And note too how the use of the roses to frame the action situates the viewer – presumably the American people: It is as if those who are viewing this scene are interlopers, voyeurs jealously sneaking a peek at a party to which they have not been invited. 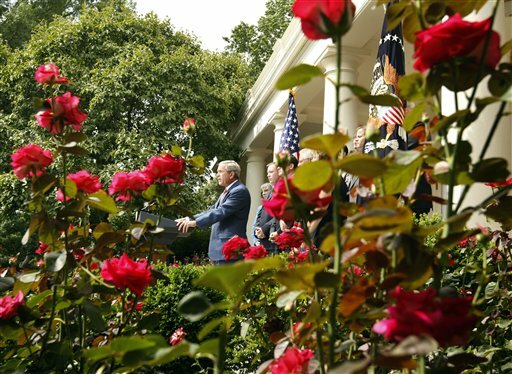 And the color seems off too, slightly washed out in a way that suggests that the roses have begun to pass their prime; the visual effect carries over to the president’s jacket, making it seem more like a drab and faded grey, than blue, his shirt and tie barely visible. It is hardly the image that an embattled president seeking public support for a contentious policy would want to portray. The differences between the two photographs are subtle but invite very different affective responses. Note first, that at the White House website the image is slightly larger than the one reproduced here. In this image the president is shot in middle-distance, and as such his body stands in comfortable proportion to the scene in which he acts. He dominates the frame and appears to be in full command of the event unfolding: Standing at a podium, speaking to an unseen audience, he is the master of his house/garden. His entourage of supporters are visible and prominent, albeit subordinate; dutifully at attention and attending to his words, they reinforce the sense that he is in control. Equally prominent is the U.S. flag, somewhat obscured in the AP photograph. But most important are the roses, which now function as a natural and pleasant setting rather than as subterfuge or camouflage. They neither obscure the viewer’s line of sight nor hide the viewer’s presence from detection. While still to the side, the viewer is now a legitimate part of the scene. The colors are rich, saturated, alive, the roses in full bloom, the suit a bright and pleasing blue, his white shirt and red tie clearly connecting him to the flag that sits behind him. Bruce: There are some straight on photographs from the front — go to the AP website and the White House. What I found so interesting was that this was the angle that was featured by the AP wire story and the NYT AND then we find the same thing at the WH. The first picture is so striking. The first thing that popped into my head was Wall of Thorns, like in the fairy tale where the castle gets swallowed up, the inhabitants are asleep and no one can get in.